Video conversion can be really easy if you use the right tools. 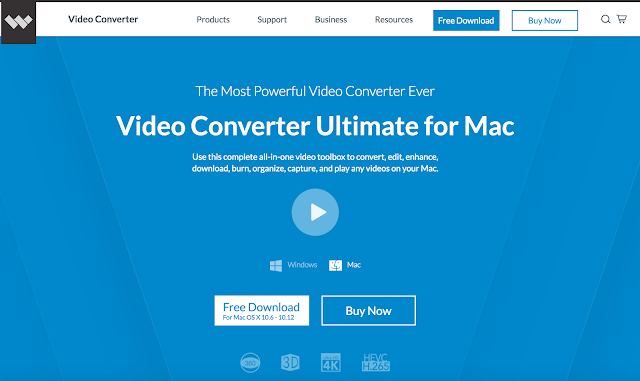 This article has a detailed review about one of the best video converter software. Below mentioned are some of the key features of this software. Video Converter Ultimate for Mac from Wondershare and Windows can convert, transcode or compress a variety of video or audio files to the format required for your playback or editing preference. This software not only converts the videos into various formats but also has a number of customization as well as export tools that are not available in many of the similar products. The clean and accessible interface of the software makes it a preferred choice. The program does way more than just swapping different file formats like AVI, MP4, WMV, MOV, MTS/M2TS, M4V, DVD, AVCHD, MKV, VOB, TOD and MOD. It also allows you to modify your video conversion for playback on almost any device. One thing that you might look out is how many videos it can convert at a time. It would not be a fair to directly quantify the number but the number of potential conversions the program can do is very high. Editing video using the Video Converter Ultimate is a fun and easy. The software supports a wide range of extensions including ProRes, DNxHD, and Apple Intermediate Codec ensuring maximum video editing quality and efficiency when you are working with Final Cut Pro, Adobe Premiere or iMovie. The video editor of the program is a great feature that is embedded in it. Though Wondershare offers a fully featured video editor as a separate application, the converter itself has some of the basic video editing tools. This application offers you functions like trim clips, video quality adjustments like brightness and contrast and also allows you to add subtitles and watermarks to your videos. These tools offer exactly what you would expect from a conversion. While editing video in the Video Converter Ultimate you can rest assured that your video quality will not diminish but get enhanced. The Video Converter Ultimate by Wondershare runs on almost every device. This is a great move by Wondershare in making the program such a way that it can run on any device. You need not worry about the device that you have. The program has the ability to convert videos that you can play on your tablet, Smartphone or TV and more with the 4K UHD support. You need not worry about how the program is going to convert your videos. The intelligent programming of the converter convert the videos intelligently and automatically for playback on a number of portable devices like iPad mini, Apple iPad, iPhone, Samsung Galaxy, Nexus or Android. When you have so many intelligent features in a software, it tends to get slow and cannot perform up to the mark of the user. But there is nothing like that in WondershareVideo Converter Ultimate. The video converter does not have a lag time. The 30X Conversion Speed feature of the program helps you convert your videos much faster compared to other converters and that too with Lossless Quality Conversion technology so that you do not need to compromise on the quality of your video. Most of the video converters may take up to 65 minutes for converting an hour-long video. Even then there remains a question on the quality of the converted video. Whereas the Wondershare Video Converter Ultimate is able to perform the same task in just five minutes and that too without compromising the video quality. One of the most important features that Wondershare has included in its Video Converter Ultimate is its ability to Convert/Copy your homemade DVD for your personal use and also Burn video to a DVD. The program allows you to burn any type of video formats to DVDs. You can choose your own unique DVD template and can easily burn any type of video formats onto a DVD for enjoying it on a bigger screen. This may look old-fashioned to the younger users but it is always a worthy choice to have a physical backup of your favorite video files. The dedicated Burn button in the software is given just to perform this task. The program is maintained in such a way for this function that it can burn your favorite video at an incredible speed of 20X. Video Converter Ultimate from Wondershare is the most comprehensive video conversion application in the segment. It allows you to convert a wide variety of file formats to almost any type of output format. It also provides an extensive collection of optimization profiles that allows you to tailor your conversion on virtually any device you own.